I always thought two parents were more than enough. 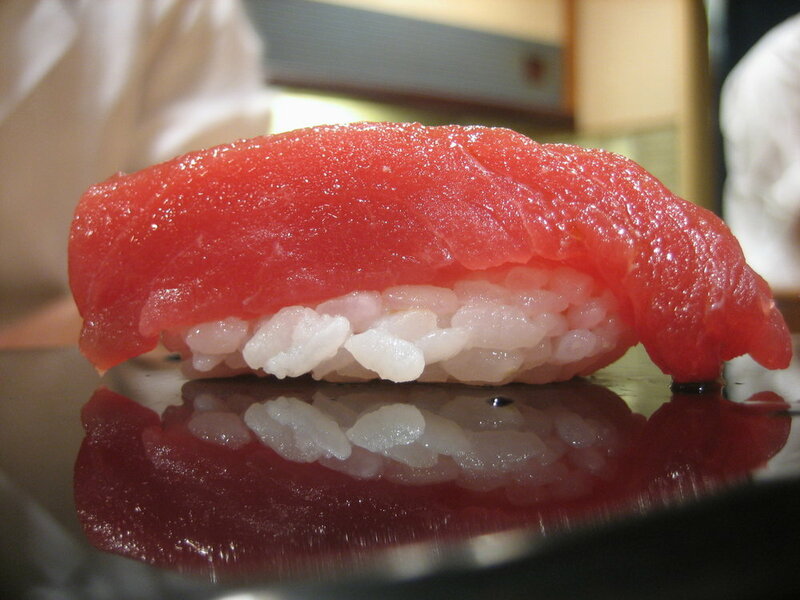 But after visiting Sukiyabashi Jiro in Ginza, Tokyo, I will be returning with adoption papers. Chef Jiro Ono has been recognized by the Japanese government as a national treasure and “modern master” for his contributions to Japanese cuisine. He has received three Michelin stars. The awards an accolades for this masterful chef are endless. And to believe he is over 80 years old. Chef Ono’s dishes are simple and straight forward: the freshest fish imaginable, warm carefully selected and cooked rice, deft knife work, and a collection of wise and sarcastic jokes. He is very serious. But unlike Masa, he was faster to crack a smile. He couldn’t stop smirking at how I took a picture of each piece of sushi and even offered to pose; though, his sharp sushi knife was a forceful deterrent. 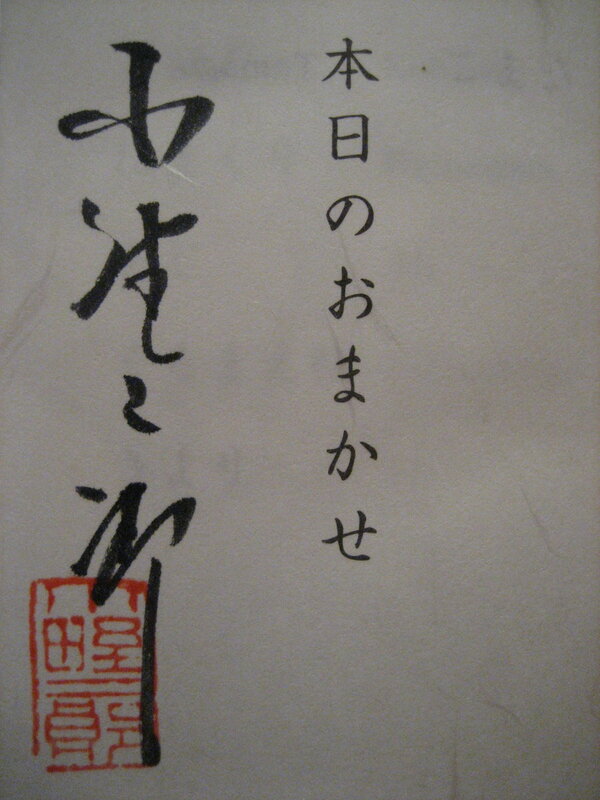 He has a funny sense of humor and is full of clever quips; my limited Japanese only understood the surface. He asked if we had any allergies or restrictions. We made it very clear that we eat absolutely everything. To me, an omakase meal is like perusing the colors of the rainbow: when everything is exquisitely fresh, it’s impossible for me to pick favorites or to dislike any of the fresh fish. It’s like asking me to chose if I like the color red or blue better; I like them both. Everything I ate here was unbelievable. We started the meal with cuts of Hirame, Sumi-ika, and Shima-aji. Each piece was lightly brushed with soy sauce and freshly grated wasabi already applied. The only accoutrement given was a healthy handful of ginger. 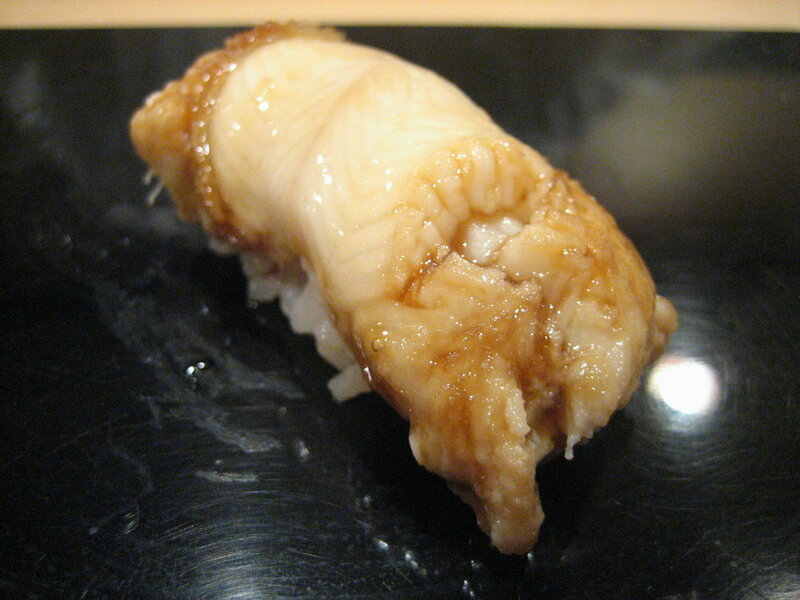 The hirame (fluke) left a trail of sweetness lingering in my mouth. The sumi-ika (squid) had a texture that I've only experienced at Kozue: not at all squeaky; but chewy and translucent. The shima-aji (amber jack) snipped as I bit through it. 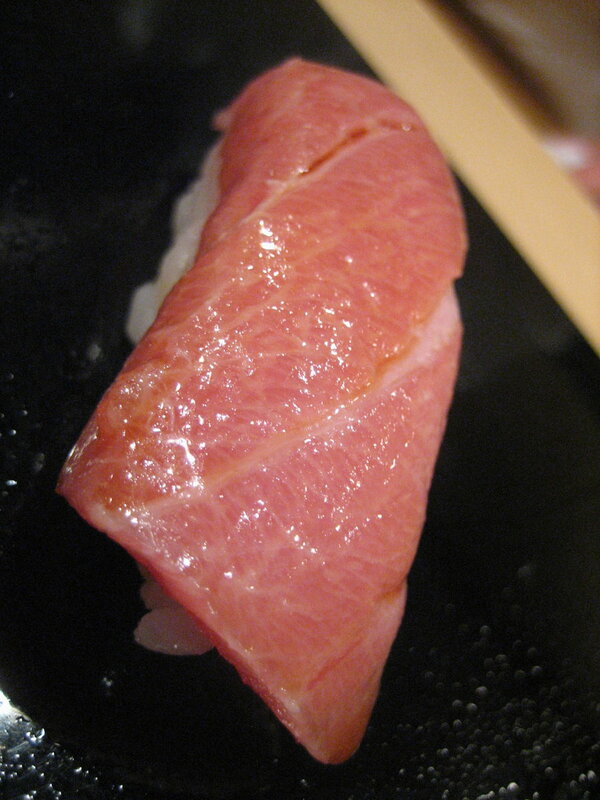 Three slices of tuna came next, akami, chu-toro, and oo-toro increasing from lean, to medium fatty, to extremely fatty cuts. 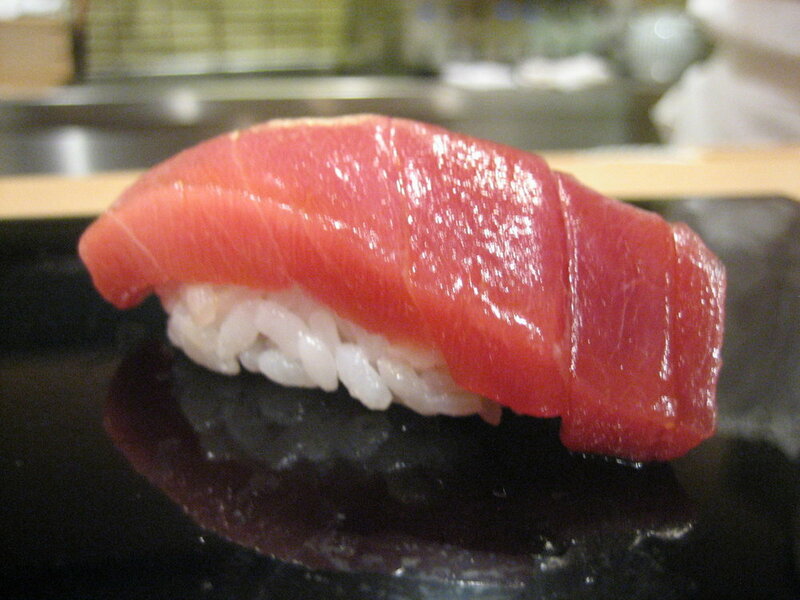 The akami (lean toro) was the most tender slice of tuna I've ever tasted that did not contain noticeable marbelization. The tuna was marinated in soy sauce for several minutes before service, perhaps contributing to this unique texture. The medium fatty tuna had an interesting mix of crunch and fat, while the fatty tuna just completely melted in my mouth. My friend with whom I shared this meal began to tear (I kid you not). Making the transition from milder to more intensely flavored fishes came kohada, hamaguri, and aji. 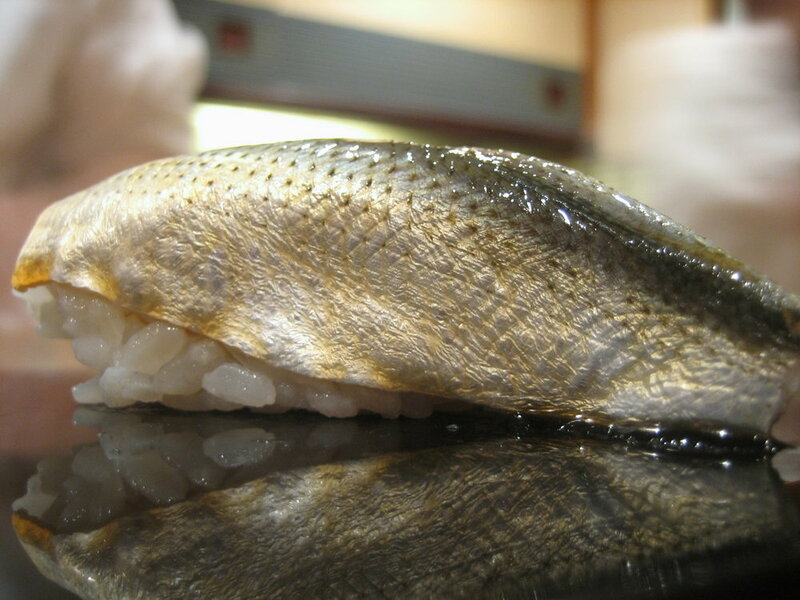 The shiny skin was left on the kohada (something inbetween herring and mackerel) amplifying the already fishy flavor. This fish literally smells like the ocean. The texture of the hamaguri (a type of Japanese clam) was crunchy yet not dry. 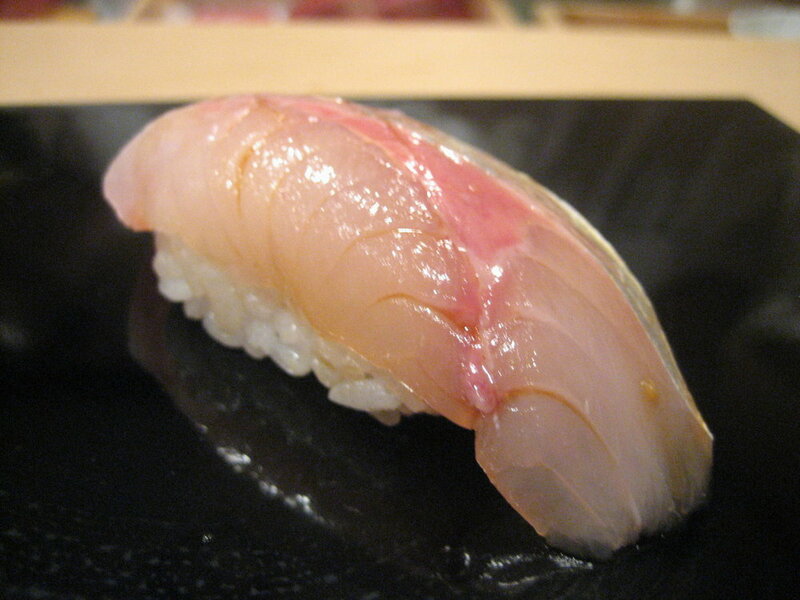 The aji (horse mackerel) was soft and smooth with thin stripes of fat stringing together layers of lean meat. The kuruma-ebi was simply gorgeous. Killed minutes before and immediately flash boiled, the gigantic tiger prawn with beautiful bands of white and red made its way to our plate. The texture of the shrimp was almost indistinguishable from langoustine: firm with a hint of pastiness. I briefly wondered what happened to the head, my favorite part; but I was quickly distracted by the next course. Chef Ono explained that the tiger prawn is sliced in such a way that the flavor and juices of the head are incorporated with the meat, and so the head itself is not necessary. 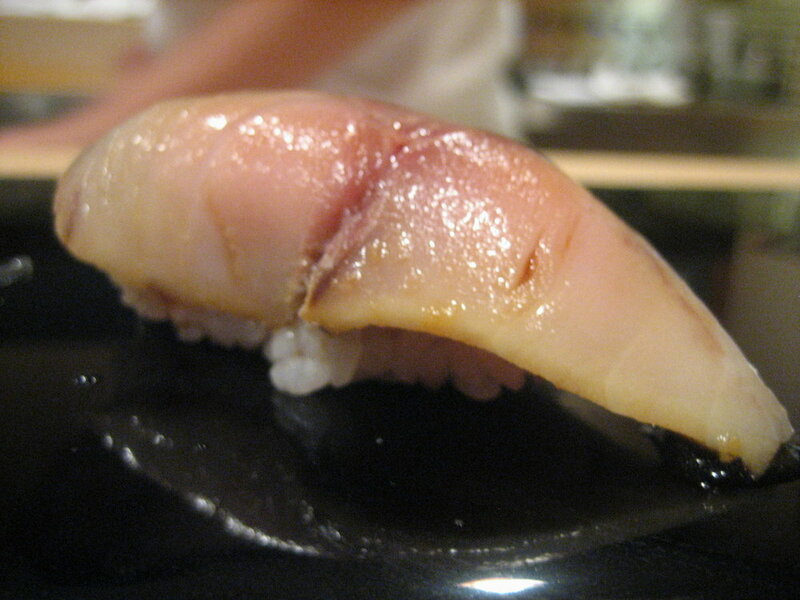 The sayori had a texture inbetween mackerel and squid: slightly crunchy yet clearly not a shellfish. The tako, or octopus, was sliced very thinly and left lightly uncooked to preserve its soft texture and to prevent it from getting dry. The edges of the fish seemed less cooked than the center, giving this slice of octopus a wide range of textures both chewy and crunchy. Saba, a skin-less slice of mackerel that lacked the strong fishy flavor that I was used to. This was the freshest saba I've ever tasted. 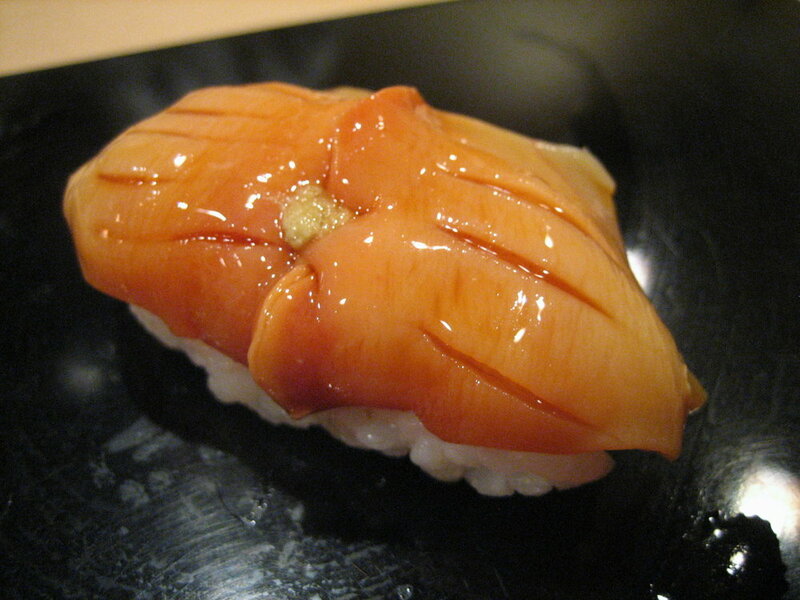 Akagai, or arc-shell clam, was a newly discovered favorite food. I am literally tasting again this as I type this sentence. A brittle and crispy yet moist clam with a strong briny flavor. Chef Ono lightly scored the surface with his knife enhancing the crispy texture. Uni. Light and sweet with a slightly briny flavor and no iodine taste whatsoever. The roe remained firm even while sitting atop the warm rice. As my friend Lizzie said during our meal at Urasawa, "you can just inject this stuff directly into my veins." I couldn't agree with her more. Kobashira, round clam abductor muscles wrapped in seaweed. This had a stiff and crispy texture much like the akagai. 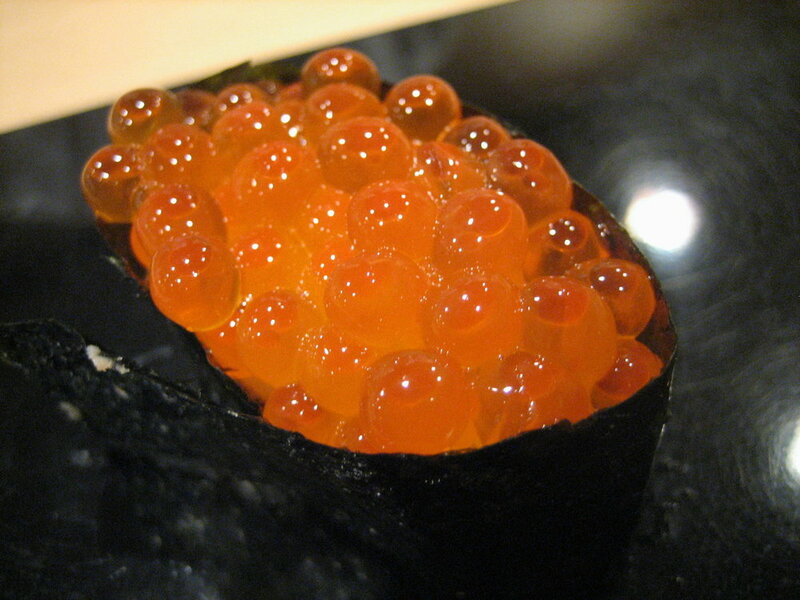 Ikura, salmon roe. One of the few pieces of Ikura sushi I've had with almost no salting. Chef Ono, in the most humble way possible, let us know that this was the best in the world. It was certainly some of the best I've ever had, right alongside the Ikura at Urasawa. Anago, saltwater eel. 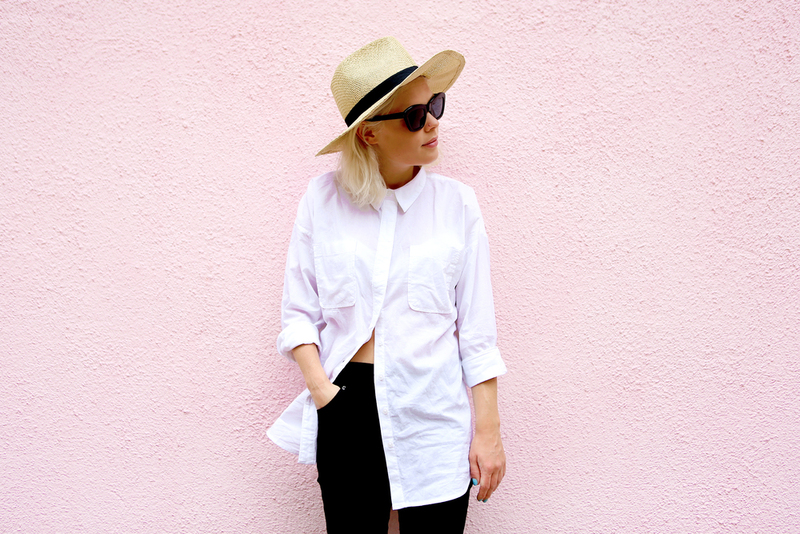 This was much leaner and less oily than usual. It was very lightly glazed with kabayaki to add sweetness. And now, time for dessert. This is how I would like to end all meals. If the quality of a restaurant's Tamago can be used as a barometer for the skill of a sushi chef, this is as good as it gets. The sweet egg sushi had a fluffiness like a dense pound cake. It was addictively sweet and marked a perfect ending to an incredible meal. The bill came, and I was told that no credit cards were accepted. Uh oh. Struggling in a panic to put together my thoughts in Japanese, I explained that I would leave my sister at the restaurant as hostage while I went to an ATM. With his slippers and in full chef attire, Chef Ono's assistant kindly walked me into the connecting subway station to the nearest machine. The machine was on the other side of the subway turnstyle; but a quick conversation with the toll guard and he let me through to the machine. I returned cash in hand to see my sister smiling with several autographed books that Chef Ono had signed for her ... she must have left quite an impression. This example of kindness is not something I'm used to living in Paris. This was undoubtably one of the best sushi meals of my life. 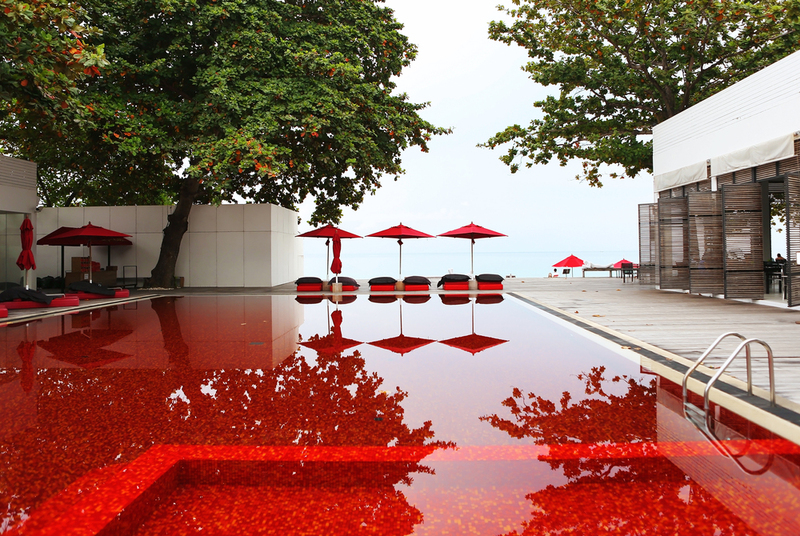 The combination of chef Ono's skill and access to the best ingredients makes this a must visit. Each fish was served at its ideal temperature. His timing was impeccable: not a single piece of fish rested for a second longer than necessary. I would recommend going with someone who speaks conversational Japanese as the staff speaks absolutely no English and, for me, much of the fun came from the chef's witty humour. It was an all around excellent experience, and I can't wait to go back.